I enjoy looking at maps - old ones, new ones, Google ones, other ones. The other day I figured out how to import my spreadsheet data into a Google map using My Maps so the locations of our local Water Association members are marked on a map. Clicking on each pin brings up whatever information I imported about that account, so it can serve as a quick reference tool. I can create additional layers of maps and show them together. For example, some of the water well permits allow for outside irrigation but they aren't necessarily members of the water association, but some are, so we could see where there is overlap. It also has potential for sharing information after disasters to show where there are helpful community resources. The maps are only as public as I want to make them, but of course I'll have to be careful about the sort of info that goes up, and who it gets shared with. My next project was to go through the county's recorded documents online and make a database of when the various neighborhood plats were recorded with the county. In our area, all the activity was from 1901 through the mid-1940s, and 1921 was the most active year. It's almost as if in 1921 the county said all the little subdivisions needed to be recorded. People are mostly interested in these old plats because legal descriptions refer to them, and also to see where there were driveways and other access back in the early days. This neighborhood is downstream from me about five miles. It was the first one I pulled up because I wanted to see if it showed the lots going to the center of the river, and it does. 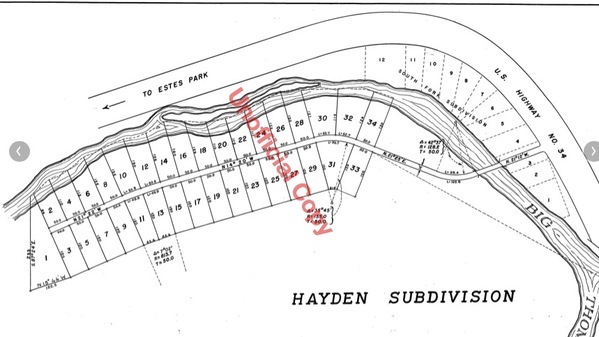 Many of the legals in deeds I've seen will say something like '330 feet south easterly to the center of the river, west 200 feet' but that particular neighborhood's deeds simply refer to the 1940 plat shown here: 'As shown in Exhibit A.' and Exhibit A says: "As shown on the 1940 Plat." That got me started on looking for other recorded plats, and that's what I did while watching the playoffs yesterday, jotted them down in a spreadsheet so I can manipulate the data. Those old legal descriptions are quaint but I can see them serving a purpose. If your legal description says you own part of the river, it would make a person more protective of the river and more concerned with it's welfare. I have no complaint about the old legal descriptions, my point was it was surprising to see one that was based on a plat instead of the metes and bounds being described. Owning part of the river is a lot more than a feeling for land (or river) stewardship. How much of the river goes with a parcel affects fishing rights and property values. In Colorado, unlike other states, we own the river bottom - so the only way to cross through our property via the river without trespassing is to float. The county says that river frontage is worth $1 million per mile. 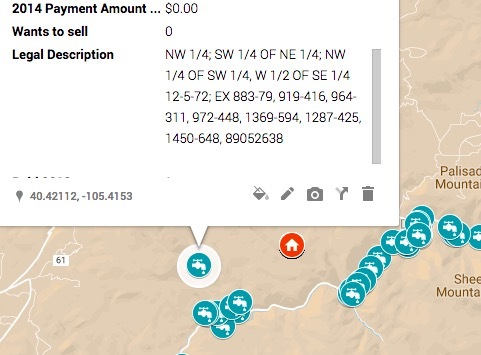 This translates to about $200 for linear foot if we own all the way across, $100 if we own to the center, and $50 if we own to the river bank, and that's recreational value only - if the lot is unbuildable. I don't know how you have the patience to do all that!! What's with the avalanches going on in your State??? 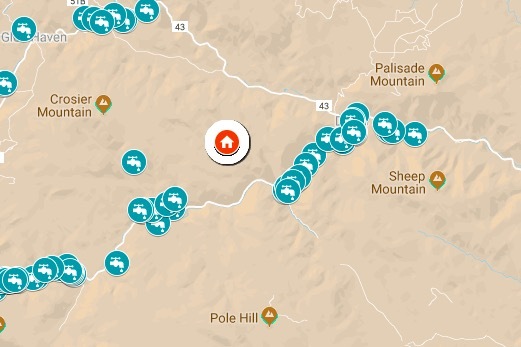 Okay, I found what the stories probably were - a back country skiing guy who lived in Aspen was killed in an avalanche the other day, and back January 5th there was an avalanche in another part of the state that killed a guy who was in an avalanche control training class. The place where he was is one of the scarier highways in the state: no guardrails, sheer hundreds of feet drops. Already this winter two cars have gone off that road killing the occupants - separate incidents. There's no guardrails because the road's too narrow and couldn't be plowed with rails there. I have infinite patience for this kind of project. Our avalanches making the news down there in Florida? They're common in the winter, and I haven't noticed any recent stories that were exceptionally newsworthy. The highway department and ski areas try to control them with dynamite blasts, and sometimes highways are temporarily closed for that, which will trigger a news item out of general interest. Sometimes skiers will venture into the back country where there is no avalanche control and trigger one that kills one or two of them, but equipment and survival techniques (including better knowledge of risky conditions) have improved so we don't hear of as many fatal ones. Well, now I'll have to look around and see if I've missed some big avalanche story. There is an application called MapBox that I have looked at, but the learning curve was so steep I couldn't figure it out. Maybe seeing how this Google app works will make it possible for me to revisit that more powerful one and do something with it. On the other hand, maybe I'll be content with what this one can do and it's free. What does it mean if the person owns a lot extending to the river's center? Does it add any water rights or other rights? See my reply to Jeri. The other issue comes up when the center of the river is changed drastically by a flood: center of river language is designed to reflect gradual changes, and everyone wants to know what a big change does to their property - did the shape/size of their lot change? No, it's still '330 feet from the corner to the center of the river' even if the river isn't there any more. Sometimes to determine our property rights on rivers and other waterways we have to go back to conditions like what was the high water mark when our state was admitted to the Union to see what has changed since. At some point the private landowners will have to get new surveys done to look at the historical river and maybe re-write their legals. Not everyone will do this until forced to when they want to sell their property or some other event such as a neighbor claiming what they thought was their land.